John McCain at a 2009 health care town hall meeting in Sun City, Ariz.
An unabashed conservative who relished the opportunity to do battle against his more liberal Democratic colleagues, he was also a willing and able legislative negotiator, unafraid to buck his own party to achieve a goal he thought important. Because of his uncompromising love of country, John was able to be a dealmaker, a true legislator, as he fought for a more perfect union and to advance policies for the public good. He was the maverick who refused to be boxed into a political position merely for the sake of party. For him, it was always country first. I first met John through my late husband, Senator Edward Kennedy. Over the years, John and Ted became good friends, but, as they both loved to say, they had not been instant friends. Indeed, I recall a moment on the floor of the US Senate in the early 1990s when John and Ted found themselves on opposite sides of an issue. 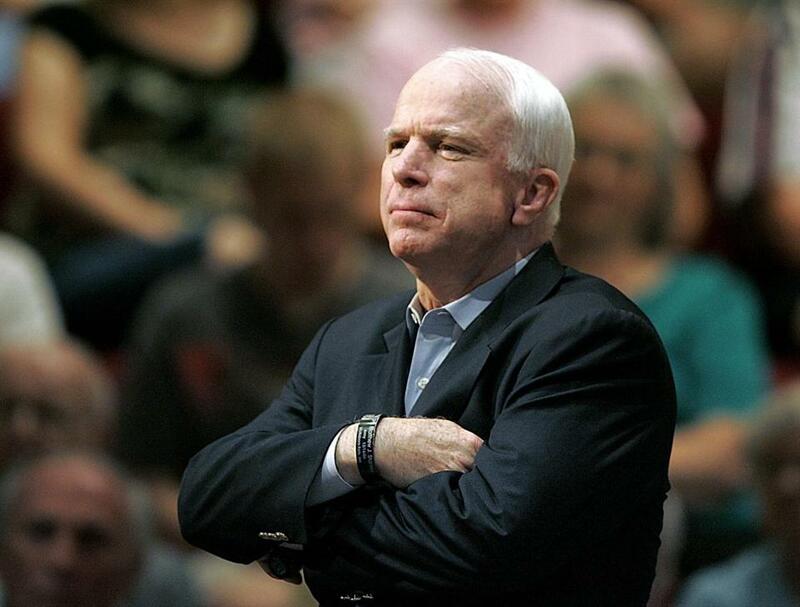 Ted had just been recognized to speak when McCain burst out of the Republican cloakroom and charged onto the floor. Teddy and John then got into a tense, but private, verbal exchange off the floor. In an odd way, it was perhaps that heat that began a thaw in their relationship. As those two old bulls walked off the Senate floor, they patted each other on the back and started to laugh. “That was really something,” one of them said. “Pretty good,” the other retorted. In that moment, all tension dissipated, and the seeds of a friendship were sown. For McCain character counts and conviction matters. Read: John McCain doesn’t want Donald Trump at his funeral. Who would? 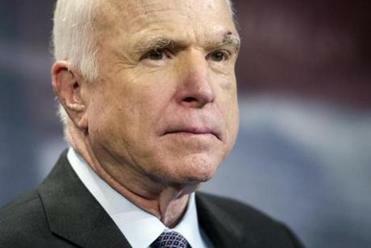 Read: What’s so great about John McCain? As Teddy used to say, John “took issues seriously, but never took himself too seriously.” His laughter could fill a room, or the entire Senate chamber. He could lose his temper, but afterwards, he always cooled off and attended to the enduring bonds of friendship. Above all, he believed in solving problems, not exploiting them — in charting a way forward wherever possible. Whether they were on opposite sides of an issue and engaged in spirited combat or working together on the same side, John and Ted respected each other. As John once said, if you’re going to like someone, you have to respect them first. And as he and Ted grew to respect, trust, and like each other, they were able to accomplish important things. In one memorable moment during an Armed Services Committee hearing on torture, Ted’s allotted time was up before he was able to complete his questioning of a witness. John was up next and, seamlessly, it seemed, took Ted’s notes and completed the questioning. At that moment, the nation saw how much more was possible when senators worked together, keeping the nation’s interests in mind without worrying about who got the credit. John and Ted also worked together on immigration, and each lamented the failure of Congress to find sufficient common ground to support a comprehensive proposal for reform. They shared a commitment to campaign finance reform as well. Ted was proud to sign on to the McCain-Feingold bill that ultimately became law and earned for John, an Arizona Republican, and Senator Russ Feingold, a Wisconsin Democrat, the 1999 John F. Kennedy Profile in Courage Award. John loved the Senate and believed in its power to impact lives in a positive way. And he was unafraid, even in his last months, to stand up for a return to comity and decency and regular order. Indeed, he declared from the floor of the Senate that the proudest and most satisfying moments of his career were when he worked with colleagues on both sides of the aisle to address the great challenges facing our nation. As we all know, John’s willingness to stand up for what was right was not confined to his work in the Senate. As a prisoner of war in Vietnam, that son of a Navy admiral denied his captors the opportunity to use him as a pawn for propaganda by courageously refusing to be released earlier than his peers. Because he took that stand, John was brutalized in captivity for more than five years, nearly half of which were in solitary confinement. But doing the right thing, and not the expedient one, was a hallmark of John’s life and career. As the nominee of his party in the heat of a presidential campaign, he demonstrated his character yet again by rebuking a supporter who assailed the integrity and patriotism of his political opponent, Barack Obama. How much we miss that kind of honesty today, and how much we miss the man who showed such valor and demanded that kind of decency. When he was diagnosed with glioblastoma, the same dreadful disease that took my husband’s life, John reacted to the news exactly as Teddy had — no self-pity, only concern for his family and a renewed drive to complete his work. In his reaction to adversity, we again saw the true mettle of the man. John’s example summons us, in his memory and for the sake of our democracy, to live up to what is best in ourselves and to honor what is best in others. In word and deed, he taught us to be valiant in the truest sense — faithful to our ideals and principles, but never demonizing those who differ, always remembering that in the next battle, they could be on our side. I think now of what he said in his eulogy for Ted: “We disagreed on most issues, but I admired his passion for his convictions, his patience with the hard and sometimes dull work of legislating, and his uncanny sense for when differences could be bridged and his cause advanced by degrees. Those words honored Ted Kennedy, but they also perfectly describe John McCain himself. Even if we disagreed with him on some issues, even some big issues, we know in our hearts that he has left us just when we most need his kind of leadership — a leadership of strength, decency, and unbending bravery. John McCain was a great hero, a great senator, and a great American. He was my friend, and I will miss him, profoundly. Victoria Reggie Kennedy, an attorney, is cofounder and president of the board of the Edward M. Kennedy Institute for the United States Senate.